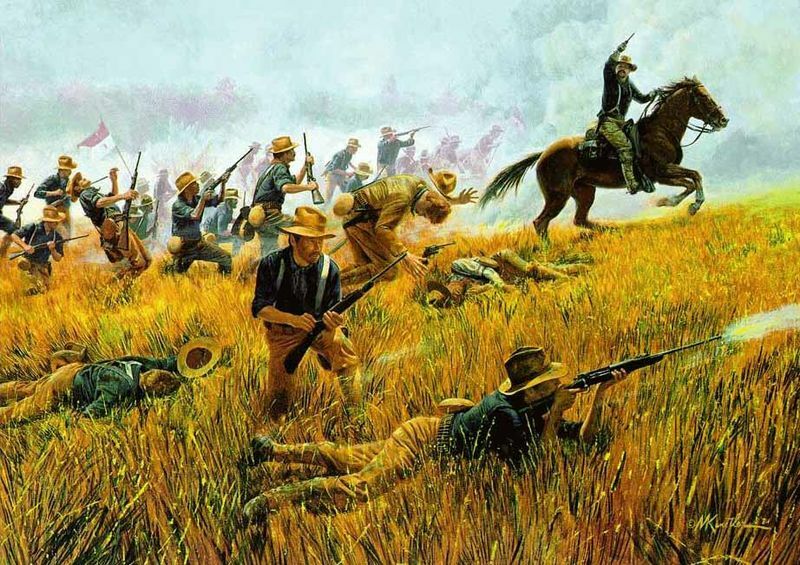 Like Teddy Roosevelt leading the Rough Riders up San Juan Hill, Pablo charged up a snow-banked slope on Sunday. As long-time readers of this blog know, Pablo avoids inclines at every opportunity and when faced with a staircase, goes into his classic “I’m-not-budging” stance. So what caused this burst of uncharacteristic activity? Our mailman. Pablo has a serious crush on this member of the U.S. Postal Service, who always makes a huge fuss over him. It doesn’t hurt that he carries dog biscuits in his mailbag. Pablo has been known to receive three of these treats in one visit. Whenever we go on our morning walk, Pablo scours the vicinity for sightings of this man. For the past week, he’s been on vacation, so Pablo has searched in vain. Imagine his joy, then, when, on Saturday, he spotted his hero across the street, delivering mail up a steep incline. Pablo attempted to scale the steps. No go. Frantic now, he took off, charging up the embankment. No way could I keep up, so I dropped the leash and watched him scramble up the hill. After a joyful reunion, Pablo gobbled his treats. Now sated, he made it clear he had no intention of coming down, so I had to go up, pick him up, and gingerly bring him down the icy steps. Here’s Pablo resting after his exertions. Notice the tip of his tongue sticking out. My mother, the writer Joan Kane Nichols, has a longstanding interest in Charles Dickens. This past Saturday she gave a talk at the Dickens Fellowship in Philadelphia where she discussed in great detail how dogs influenced his life and work. I attended and learned a lot, including that King Charles spaniels were once bred with pugs to shorten their snouts. Who knew? 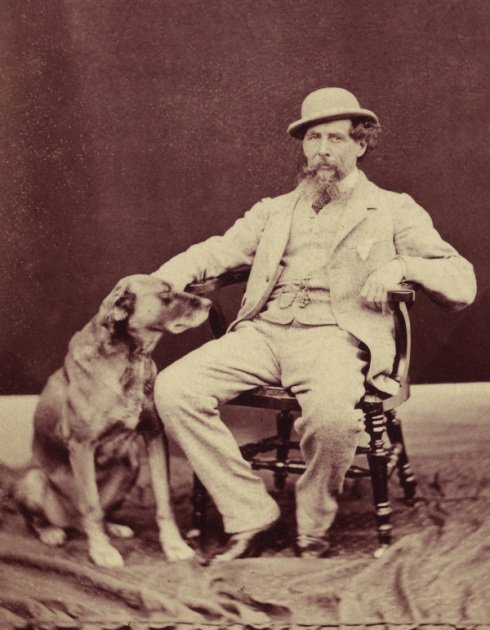 For the next several weeks, she’ll be posting more info about Dickens and his dogs on her blog, Dickens: women, children, and dogs. The first post, about his faithful dog Turk (pictured above), is already up, so wander over and take a gander. We’ve been lucky. So far winter has been mild and Pablo hasn’t had to wear any of his dreaded sweaters or coats. But an overnight cold snap brought more than a touch of nip to the air so Pablo had to bundle up for his morning walk. 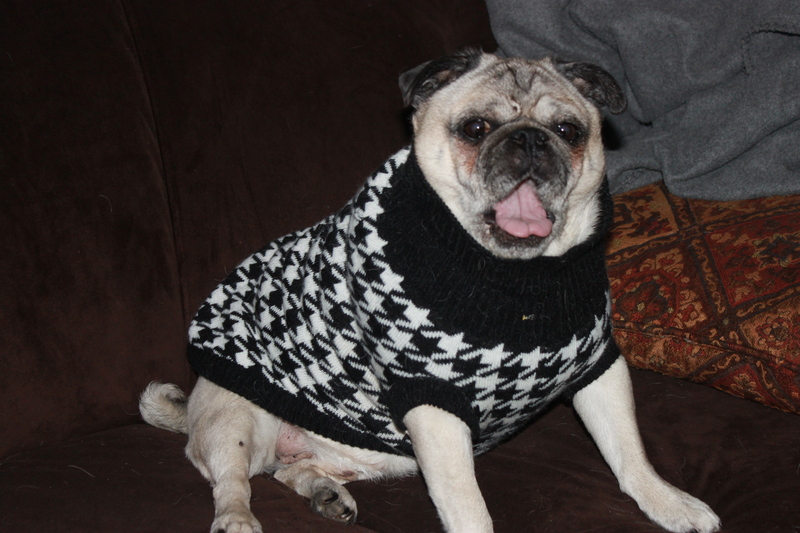 While he’s as dashing as ever in his houndstooth sweater, I must confess that this year it’s a bit snug. I fear Pablo has put on an extra pound or two since last year. Perhaps it’s time to put him back on a diet–or buy him a bigger sweater. 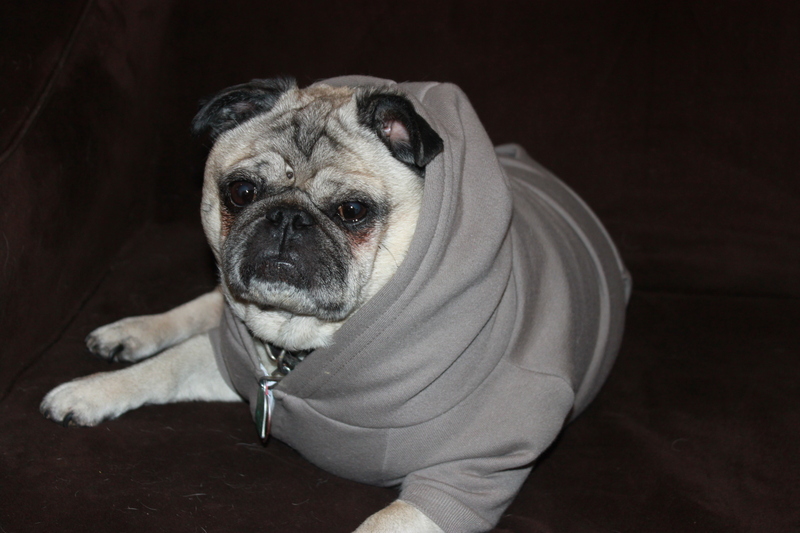 For some reason, whenever Pablo wears his new hoodie he takes on this tough guy persona. It cracks me up. Sometimes I like to get back at Pablo for all he puts us through at mealtimes with his nonstop begging by photographing him when he’s trying to sleep. 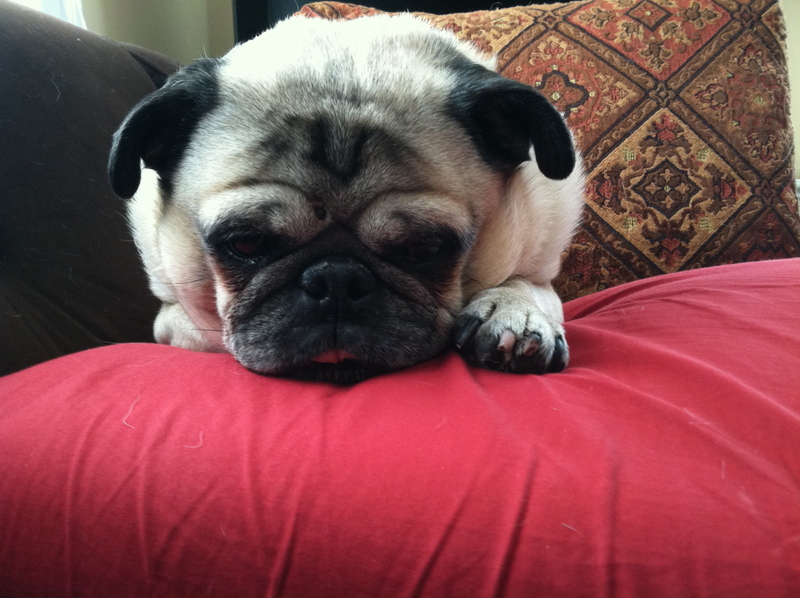 Here’s a shot of one disgruntled pug. 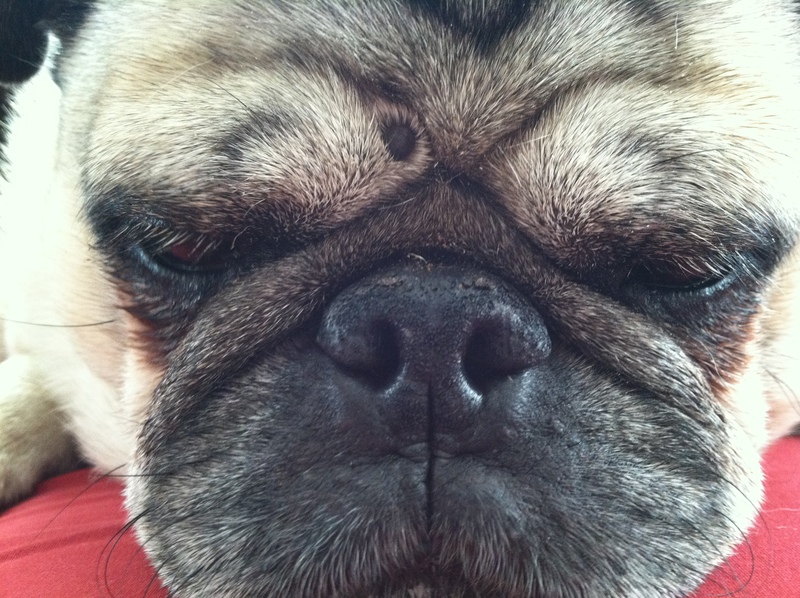 Don’t worry, he’s asleep now and snoring away as only a pug can.